A Favorite Stout Gets a Facelift! Working with BrewLink Brewing has been a whirlwind of success, with many designs being requested and hitting the shelves in remarkable timelines. This has been a lot of fun for me. With plenty of creative freedom and cool beer names to design from the work doesn’t seem that “worky” at all. With this roller coaster of a journey I am happy to report that the beer I’m designing for is pretty darn amazing! So much so that demand often outweighs supply. From this peak of success came the idea to take the most popular beer to date and mix it up just a touch. The white stout has always been a fan favorite and having tasted it, I can see why. 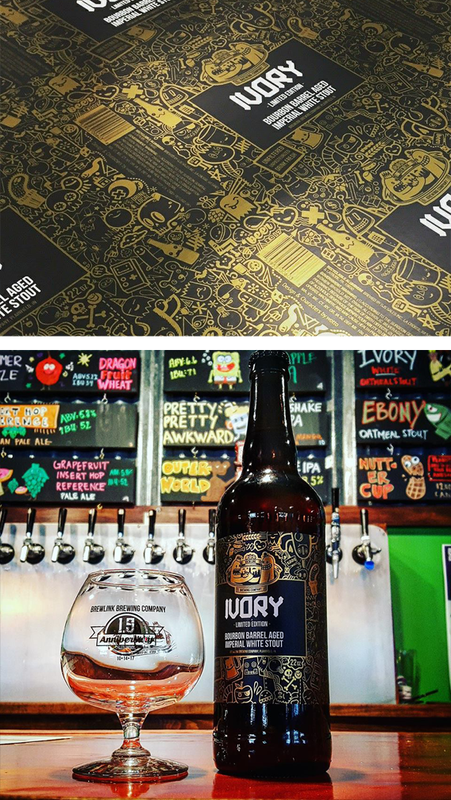 For the anniversary of the brewery the guys decided to release a special limited edition white stout. ‘Bourbon Barrel Aged Imperial White stout’ was born and everyone was pretty excited about it. This time round the design got some fancy treatment in the form of a bottle and metallic gold label. I was pretty nervous to see how this one would come out, being the first bottle. I’d always envisaged that one day my doodles would cover a beer bottle. The metallic ink was a stroke of genius and the whole thing came out very cool. Now to get my hands on a bottle to sample…..
No comments. Post the first one?